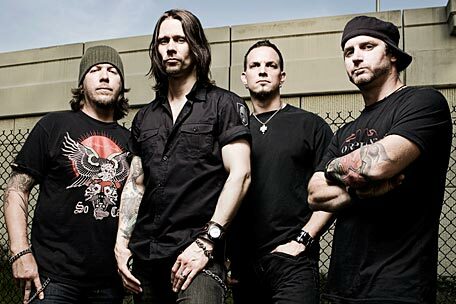 Positivity and a hopeful outlook have always been a standing theme for the hard rockers of Alter Bridge. However, things take a darker turn and get heavier than the band did in either previous full-length on their newest album, 'AB III.' But rather than turning the video for 'Isolation' into a narrative matching the album's theme, the lens was taken on their current European tour. "It's a look into the real life of this band and not some put together story," guitarist Mark Tremonti told Noisecreep while in Italy on the tail end their eight-week overseas trek. "It's a tribute to the fans. It's a look into the tour. We just wanted to show how it is out on tour with us and our interaction with the fans by including them in the video." Directed by Dan Catullo, the fast shots focusing on the crowd give 'Isolation' its own mark in a long-honored tradition of videos shot on tour. "There's a lot of great live videos," Tremonti remarked. "Some of the best are big festival videos like Rage Against the Machine's 'Bulls on Parade,' but this one captures the true essence of our crowd and fan base." 'AB III' is out now and Alter Bridge begin a US tour on Dec. 10.